The thing about today’s trip to ER is that it could have been avoided if our medical system was more efficient (and logical!). First, some background. Our daughter has been having health problems since January when she was first hospitalized with severe anemia and kidney failure. A 10-day stay in the hospital was followed by a relapse, causing another trip to the ER and another 3 day hospitalization. In February she ended up in the ER yet again. Following this, a high dose of prednisone helped her regain her health and return to work. Under the care of a nephrologist she has been tapering off the prednisone, dropping 10 mg a week since March 25. Now, at 20 mg, some of her symptoms seem to have returned, and we were afraid her kidneys were failing again. 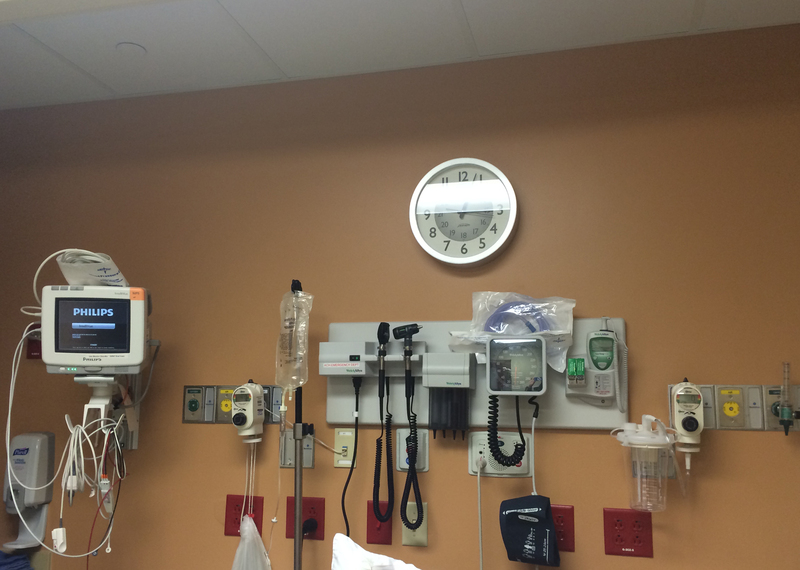 She had hoped to resolve her fears by calling the nephrologist’s office and keep the ER out of it (or rather herself out of the ER!). When her symptoms first returned yesterday, she tried contacting her nephrologist twice, leaving messages that were never returned. She tried to go to work but could only manage a few hours. Still feeling dizzy and light-headed, she tried the nephrologist’s office again this morning. It turns out that the doctor never received her messages because he is out of town for the week, and the doctor available was never given her messages. Doctors’ offices seem, as a rule, to be unable to handle situations of this nature very efficiently. If a doctor had assessed her situation yesterday, blood work might have been ordered immediately and the results known in short order. Our daughter considered a trip to a local med center, but blood results would not have come back right away. In our daughter’s case blood work would have easily diagnosed, within a few hours, if her kidney failure was reoccurring. Instead her only alternative was yet another trip to the ER, the most costly option. We all have heard that many people end up in ER for health problems that could have easily been handled by a simple consultation with or trip to a doctor. But it is nigh onto impossible to get in to see your doctor without long waits and pre-scheduled appointments. People also go to ERs because they don’t have insurance, but the new health care law should hopefully help reduce some of those visits. But the Affordable Care Act won’t resolve the problem of doctor availability. People like our daughter who are trying to avoid a costly ER visit have limited or no other options when doctors aren’t available to handle such situations. The reasons for this are many and varied. Doctors and nurse practitioners are in short supply, most often unable to see patients on an emergency basis—or even in any kind of timely fashion. Then, even if they are in their offices, communications breakdowns and obstacles abound. Receptionists are often poorly trained and underpaid. Medical offices are quite typically poorly organized. They lose messages; they forget to handle, or mishandle, the communications they receive. And, mind you, even as we rant a little here, we must say we very much admire our doctors for their skill and dedication. We aren’t complaining about them as much as we are about the system that surrounds them. The haphazard way in which the receptionist fielded our daughter’s call, unfortunately, seems to be the rule, not the exception. Just last week Joan called her ophthalmologist’s office due to a reaction to an eye medicine. She got a call back the next day from a triage nurse telling her to stop using the drops (Joan had already decided to stop them when she didn’t get her call returned the day before.) The triage nurse was to contact the doctor to see about using another medication and get back to Joan. That doctor works primarily out of another office so he wasn’t physically present when Joan first called. Never receiving a call back, Joan called the office again one week after her initial call. Apparently the doctor never got the fax the triage nurse sent him (they said the fax was broken!). And no one thought to follow up. So the message fell through the cracks as it did in our daughter’s case. There appear to be no procedures in place to double-check whether messages get to doctors and whether responses are made in a timely manner. If one part of the process falters (fax not received, doctor out of town), nothing happens unless the patient calls repeatedly, wasting everyone’s time. When something is serious, it prevents obtaining treatment in a timely and cost-effective fashion. For many of us, there seems to be very little middle ground between going to an emergency room and having a doctor’s appointment. Affordable, well-staffed clinics might be a solution, but they are in short supply. For us today’s trip to the ER had a happy ending (in the sense that our daughter does not appear to be relapsing into interstitial nephritis). She is most likely coming down with something more minor, as we all do from time to time. But the fact remains that this ER visit could have been prevented if a simple message had been delivered and a simple phone call returned.